This past week Wu Han returned, for the fourth time, to the Ok Mozart Festival in Bartlesville, Oklahoma, about an hour north of Tulsa. Joining her were many fabulous musicians, here assembled on stage where David, as surprise guest host, interviewed all of them before a concert. 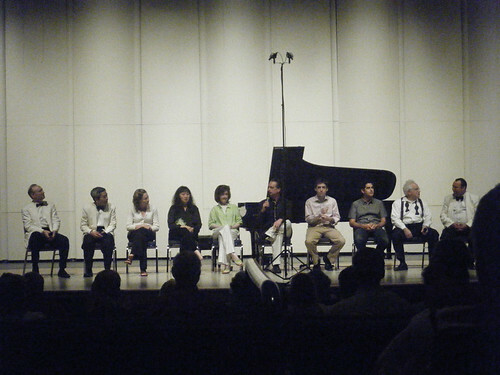 From left to right: violist Paul Neubauer, violinists Nai-Yuan Hu and Lily Francis, Wu Han, pianist Anne-Marie McDermott, David, oboist James Austin Smith, violinist Arnaud Sussmann, and cellists Fred Sherry and Peter Wiley. In less than a week, Wu Han performed a daunting selection of solo and chamber repertoire: A Mozart duo for piano, four hands; Mendelssohn’s Midsummer Night’s Dream suite for piano for hands; arrangements of opera arias for four pianos, eight hands; Pierre Jalbert’s Piano Trio; the Taneyev Quintet; Schubert’s Lebensturme for piano four hands; Krenek’s Four Pieces for Oboe and Piano, and the Mozart D minor Fantasy for solo piano. A highlight of the visit was the performance of the riveting Piano Trio by Pierre Jalbert, which will also be performed on this summer’s Music@Menlo festival. 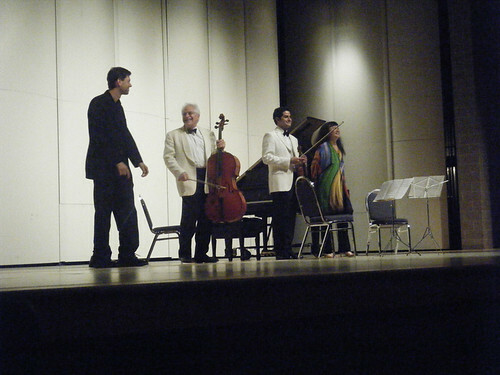 Joining Wu Han were violinist Arnaud Sussmann and cellist Fred Sherry.